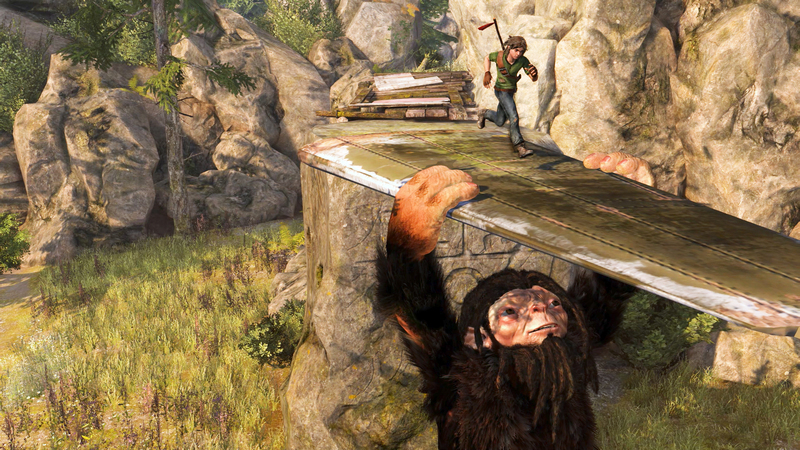 Troll and I is an ambitious adventure puzzler with deep Nordic historic roots and a narrative fit for a fable; following an awful destruction and tragedy, a young boy befriends a sought-after beast who turns out to be a gentle giant. 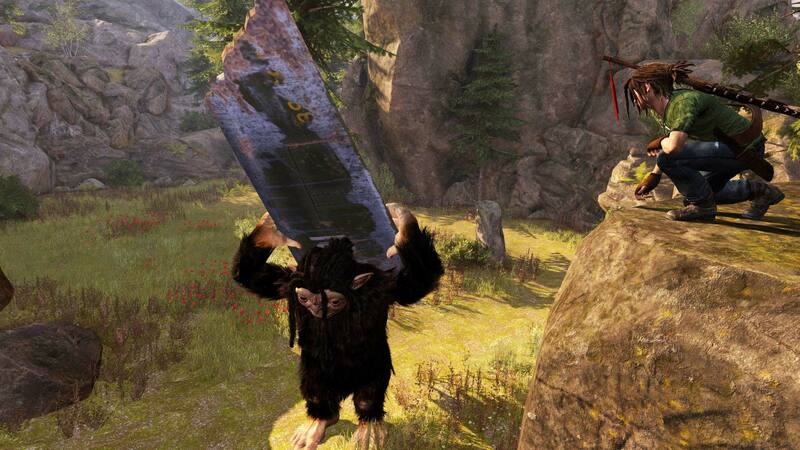 However, the execution of the game is a far cry from its ambitions for a plethora of reasons, making it hard to stay focused on what makes Troll and I a unique experience – the friendship between man and beast. This makes Troll and I a hard game to review. I can see the goodness and the ideas gleaming through the cracks in Troll and I, but ultimately it is not a pleasurable experience to play. An opening cinematic full of exposition sets the scene; a beast has been spotted and a hefty bounty added to its head. Troll is wanted – dead or alive. Following this, we are introduced to half of the game’s protagonists – Otto. A short hunting tutorial left me worried about this game. Seriously worried. I gathered materials for a spear – I knew to do this due to the large button prompt, the likes of which I haven’t seen since Parappa the Rapper. I used my Nordic teenage hunter-gatherer instincts to track a boar. The tracks appeared highlighted, I guess? I couldn’t see them. It took me a shamefully long time to hunt those damn boars – which by the way took more than one spear to slay. Anyway, boars gathered for dinner, it’s time for another cinematic. A fire breaks out and Otto is separated from his mother. Escaping from the fire and falling trees is a series of quick time events which are rather frustrating since the controls aren’t as responsive as they could be – rather than being down to my lack of skill (which I don’t dispute), a lot of the time I found that failure was down to the game’s shortfalls. The game’s controls themselves aren’t bad; however, their responsiveness leaves a lot to be desired. Especially with quick time events, as I mentioned above. The missing polishing touches from the controls mean that rather being impressed or having fun with the puzzles, a lot of the time it leads to frustration. Navigating around Troll and I is unfortunately another gripe. The general inability to get your bearings is a problem exacerbated by the lack of an in-game map, or radar. Whether this is a stylistic omission, forcing you to “explore unknown lands” or whether it’s just an oversight by Maximum Games, I don’t know. But what I do know is that the lack of any navigational tools artificially extends the game’s playtime as you wander hopelessly around the world – which often looks very similar, compounding the problem. One thing that Troll and I heralds well is the almost insistence on co-operative play. My co-op partner and I had a lot of fun working out various puzzles in the split-screen mode – even though most of the puzzles involved us trying to figure out where each other was in the game world. This collaboration is mimicked in the growing relationship between Otto and the not-so-bad-after-all Troll. Troll and I doesn’t hold your hand very much; you will be just man (well, boy) and beast alone in the open (ish) world. This is fun and gives you the chance to explore the world as you see fit, stumbling across more puzzles and routes through the game. I did however spend more time than I’d like to admit wandering around one particular area looking for a solution to a problem. Turns out I was not using Troll in the right way to progress. Speaking of using Troll, being able to switch between characters on the fly is great and brings a sense of cooperation and collaboration, even when playing solo. 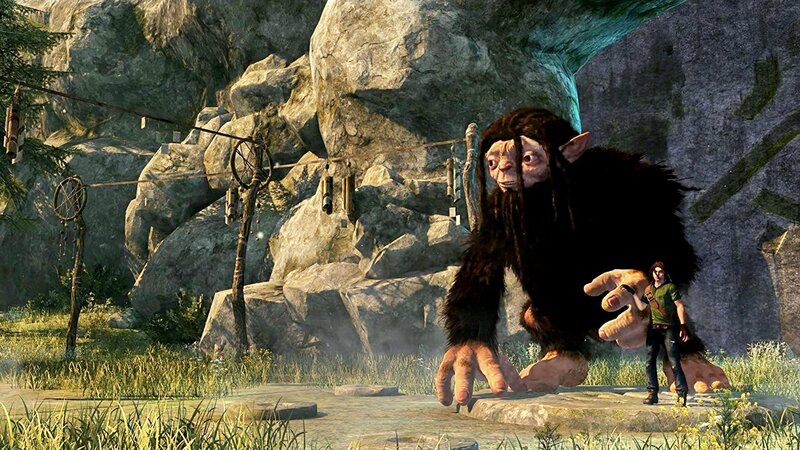 Troll and Otto are contrasted greatly and it just makes sense: Otto is nimble and agile, and able to craft weaponry to defeat his foes, whereas Troll can heal and deal massive amounts of damage to enemies by using bellow abilities and just brute force to wipe out hordes of enemies. Troll’s attacks are a little frustrating – you’d expect him to be able to detect where enemies are, but oftentimes his ground slams will hit nothing and you’ll be left with egg on your face. Otto fares better overall, in combat. 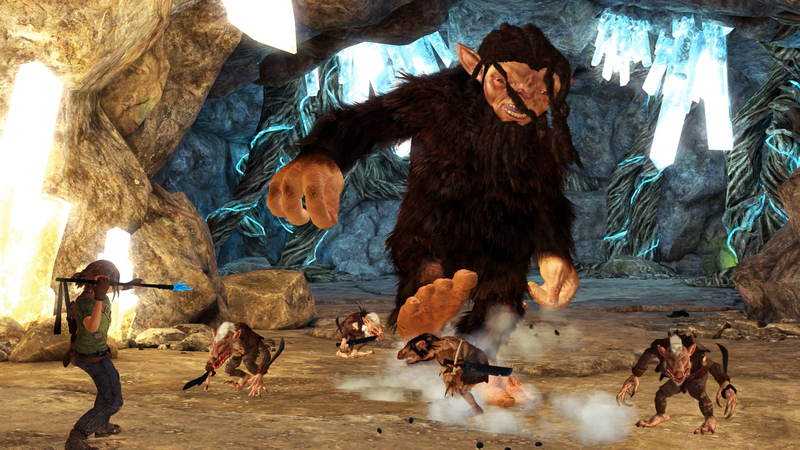 His agility and nimbleness grants him the ability to dodge roll and engaging enemies on the ground level is obviously more accurate and all-round nicer to use than Troll’s caveman-esque bashing. Otto does have a few finishing move animations which are nice the first few times they trigger, but eventually get a little tiresome. So, let’s talk a little about the game’s technical specs. Troll and I is plagued with bugs – hell, I couldn’t even play the game for a few days as the loading screen was stuck, and after the first cinematic it kept booting me out. It was as if the game was trolling me (sorry). The camera glitches out when manoeuvring with Troll and also, the game’s graphics are… bad. There’s no two ways about it. There is nothing here that warrants this game being on Xbox One. Think early Xbox 360 graphics and you’re not far off. Like – what happened? The game’s assets are largely rocks and grass, but they can’t even get that to a high standard. Troll and I borrows many things from many games, and has mashed it all together to form a weird Frankenstein’s monster of a game. Don’t get me wrong – the premise is fantastic. When I saw the trailers I was instantly (as many were) reminded of The Last Guardian for PS4. However, the execution of the game falls way, way short of the mark. If you’re going to attempt to copy the parkour from games like Assassin’s Creed, make it better. If you’d like an upgradeable weapon system, make it at least worthwhile to the players. Maximum Games have a solid premise throughout Troll and I, and the game can be made much better with patches, but ultimately Troll and I will be lost to the vast majority of players who are unwilling to see the game for its good points opposed to its potential. Next article5 fresh faces drop in to Xbox One backwards compatibility – Are they worth the return?